Automatically downloads and installs print drivers (PostScript/PCL 6). TWAIN Scan Driver Installer for the WorkCentre 3615 for legacy workflows that require a TWAIN scan driver. Utilities for the WorkCentre 3615. This package installs the Address Book Editor and Express Scan Manager. 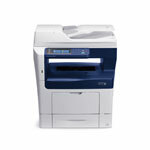 The Express Scan manager can only be used over USB and must also have the TWAIN Scan driver installed.